Description: Invite handsome styling that greets a distinctive sophisticated look into your home or business. A Frosted Glass luminaire is perched atop of a custom tailored bobeche, which is accented with a long slender decorative stem embellished with a ball point accent for a high level of aesthetic appeal. Stunning solid steel hardware is featured in a Cajun Spice finish. Ideal for hallways, foyers and other spaces in homes, restaurants, pubs, hotels and other fine interiors, the fixture is custom crafted by highly skilled artisans in our manufacturing facility in Yorkville, New York. Custom sizes, designs and colors are available. 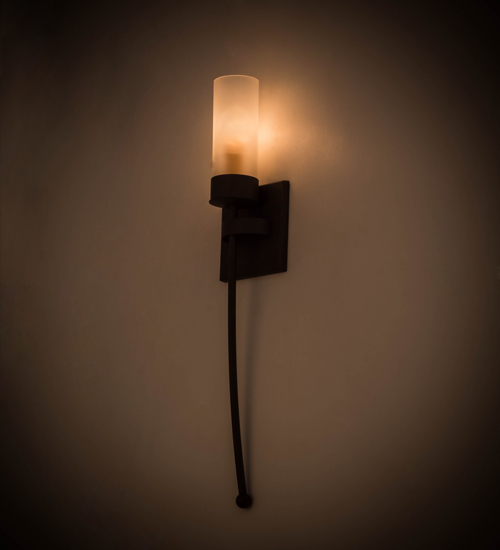 The sconce is UL and cUL listed for damp and dry locations.